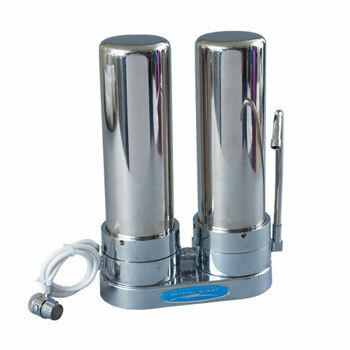 Table Top Water Filter With Two Cartridges by Crystal Quest is a 2-cartridge system with 7 stages of filtration. 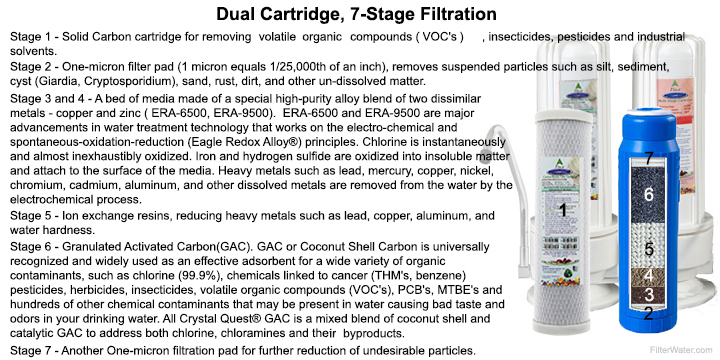 A 5-micron solid Carbon Block(Coconut Shell) cartridge acts as the pre-filter which removes volatile organic compounds (VOC's), insecticides, pesticides and industrial solvents). 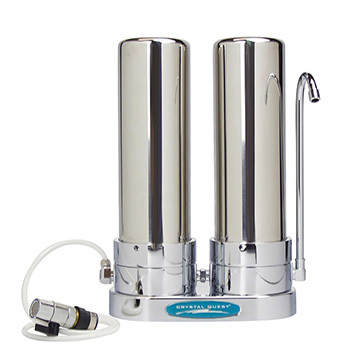 It simultaneously removes chlorine taste and odor, and organic chemicals that contribute to taste and odor, while providing the particulate filtration and dirt-holding capacity of an efficient 5µm nominal sediment filter. Carbon Block filters deliver extended life while removing sediment and organic contaminants from water, aqueous solutions or suspensions. Second cartridge is the standard 6-stage filter. Contains a combination of Granulated Activated Carbon (GAC) and Eagle Redox Alloy media that increases the systems' effectiveness in removing hundreds of other contaminants from your tap water. 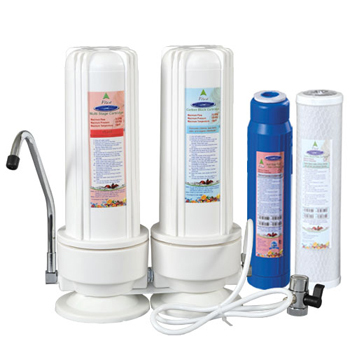 This filtration setup is an excellent choice to get pure and healthy water for your family. Counter-top water filter systems installs in seconds and sits on the counter for water on demand. Feel the convenience of having filtered and unfiltered water in one easy switch. This unit can remove 4-methylcyclohexane methanol, or Crude MCHM. Carbon block(Coconut Shell) cartridge greatly reduces sediments and Volatile Organic Compounds (VOCs). Granulated Activated Carbon(GAC) and Eagle Redox Alloy media fights hundreds of other contaminants. 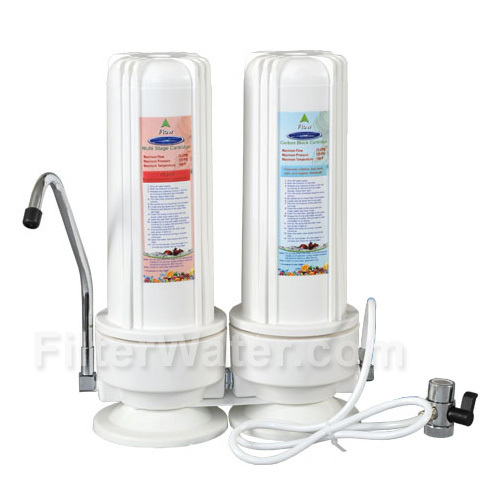 Comes with a diverter valve, switches between filtered and unfiltered water. Quick and easy to use, stylish and convenient. - The system installs in minutes and sits on the counter for pure water on demand.